"I have watched with amazement the incredible discipline instilled in the members of the Minnesota Boychoir, but not at the expense of enjoyment. The boys obviously work hard, but they also look like they're really loving what they do. It takes a rare talent and strong organizational structure to be able to achieve that. And, of course, the music is incredible. Our grandson has only been in the Boychoir since early fall, so we have had just a few opportunities to see them perform, but the concerts have all been first rate. How proud we are of our sons/grandsons/nephews who are learning and growing as musicians and as individuals, and how grateful to the Minnesota Boychoir for what they are giving the choir and its audience." "The Minnesota Boychoir is a simply amazing organization. It provides boys with opportunities to work together to learn and perform beautiful music, provide service to the community, and sets high expectations. 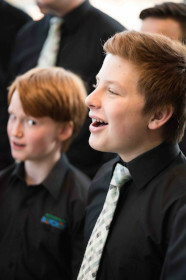 Boys grow through their involvement with the choir; each member learns how to be comfortable in intense and demanding performance situations. My four sons are all members of the choir. Each has developed a love for music, increased focus, made strong friendships and had a positive experience. The choir has been so important in my eldest son's life that he plans to pursue a bachelor of music in vocal performance in college. The choir also has a hardworking group of volunteers and a dedicated board of directors." "The Minnesota Boychoir is one of the best run organizations with which I have ever been associated. My child has benefited tremendously from his affiliation with this group, and I expect he will remain a member for the next decade. It does so much for our community and for the development of a diverse group of children who share their talents with each other, their families, and their many audiences." "My son has been a part of the MN Boychoir for the past 6 years, and I have had the wonderful privilege of being a backstage parent for the boys for all of these years. This organization means the world to my son and I. The MN Boychoir has given my son so much more than we ever expected. 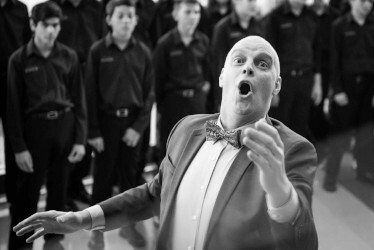 They hold true to their mission of challenging boys and young men from many backgrounds to the highest standards of choral music, nurturing the development of exceptional character, and inspiring and benefiting the community. I have probably been to hundreds of their performances, and each one is as amazing as the last." "I was a member of this choir for 11 years and I would not be who I am today without this choir. I have had amazing experiences throughout the world including Canada, Australia (We sang in the Sydney Opera House, still my favorite moment in my life), and Italy (We sang in St. Peter's Basilica, also an unforgettable memory) that I would never have dreamed of having without it. Also, the music has such a great impact on people. After our free and open to the public concerts, we would go out and talk to the audience, and people would always tell you about songs that made them smile or cry. It is amazing to be able to have an opportunity to move people that way. The Boychoir helped me become more of an outgoing person and gave me friends that I will never forget and who I regularly keep in contact with. It is also one of the most welcoming groups of people I have ever met." I send this both at a personal level as well as on behalf of the many people who spoke to me after the 9:00 mass this morning. Our congratulations to yourself and the boys for making the mass beautiful and uplifting. Our appreciation is best summed up by a fellow who has been coming to this mass for the last six months and who struggles with many psychological and physical issues. His typically Australian understated comment (with tears in his eyes), following the communion hymn, was "Life's worth it, Tim, when you hear those Mother Mary waves." Our prayers for your choir's safe travels in Australia and please pass to each of the young men our thanks and best wishes." Have just returned from the Sydney Opera House absolutely elated at hearing your choir. What a tremendous sound - full of rich beautifully blended voices - excellent diction, great tonal control and colour, refined and poised singing. It was a real joy to have heard you. Whenever you visit Australia next, please include my school, The King's School on your itinerary (www.kings.edu.au). I would love to host you without reservation. Very best wishes to you and your choir."